We never touched the Great Sand Sea, but it touched us. The road from Bahan Hollow to Hellpsort overlooks the southern reach of the Southlands’ most lethal desert. The sun was descending into the Ocean Delb as we walked west. A few paces beyond the road, the cliff tumbled in a frozen flight of sheer-stepped rock and scrag shrubs down and down into the clouds of sand and dust that perpetually shift over the Great Sand Sea. We continued along, far above–or so we thought–the breath of the Great Sand Sea. The sun set and an evening storm of electricity and shadow quickened and swept inland from the Delb. It spread fast. Before the first of the Six Sisters had pierced the dusk, black and blue lightning leaped from clouds to sky and down. Winds came at us; we had no shelter along the wide road, atop the cliff. We did what seemed best: moved off the road, away from the drop, toward the shrublands. Dust pursued us, pushed by the storm. Thunder resounded. I looked back, compelled by other sounds, too: howling that was too animal for the wind, a snapping like fire. Sharp sand, like thistles of glass, stung my face. I tell you that the Great Sand Sea holds eldwyrms. I saw one riding the shadow and lightning currents blown in from the Delb. Before I could look away and plunge into a sheltering cluster of shrubs, I saw its tattered wings like rags and did not understand how it held itself in such winds, how it rode them, its electric carnivorous eyes incomprehensible with joy, terror, or both; I could not tell. Hellsport, formerly Jannyn or Saint Jannyn, is the westernmost city in the country of Cammaris. An isolated and insular city, Hellsport is bordered on the west by the Ocean Delb and the Natchmure Isles; to the east the mountainous Jags and Buctles rise and give way to a meager stretch of prairie that is subsumed by the Great Sand Sea. The Mercantile or Port District at the westernmost edge of Hellsport terraces up from Damnaub Bay. Larger ocean-bound vessels crowd the inner bay, with local fishing and crabbing skiffs pushing in and out from the northwest arm. Trade with the Natchmure Isles and lands beyond has increased during the reign of the Princes as predation by pirates has significantly decreased. The Princes remain officially silent about their involvement with or antagonism toward the pirates, though the local population continues to speculate freely. The closest city is Lamial to the northeast of the Great Sand Sea. Between Lamial and Hellsport is the small town of Crescent Village, which supports Wedgewood Academy, providing food, services, and instructors. As the Academy has suffered decline in the wake of the Princes, so has the village. Southeast of Crescent Village, the Wedgewood abuts the Buctles and thins into the Great Sand Sea. Tucked into a pocket between the Buctles, the Great Sand Sea, and Margil Lake, the people of Margil Prarie farm and hunt. The Margilites have welcomed the recent establishment of Bronch, a Paltinian community founded in response to the religious repression of the Six Princes of Hellsport. The Paltinians of Bronch depend on the Margilites for food; in turn, the Palintians provide charms, remedies, and rituals to the Margilites. I find your usurpation of the Hellsport Handbook acutely irritating. Your trickery and lies are most upsetting. But I will proceed with my characteristic calm. I am already in Lamial, you see. I begin work at once, while I hand to you the Hellsport work. Congratulations! P.S. I could contribute a section on the establishments of High Ock. Consider. Let me articulate more clearly what I intend. These Traveler’s Handbooks are tools for cooperative imagining. In my experience with role-playing games, I’ve often felt disappointed, as if a potential for creative and collaborative story-telling had not be reached; had been not only missed but constrained by rules. That’s why I like rules-light systems like The Window–the focus is not so much on character sheets but character and character development. Life is complex. I’d like my games to reflect that. I like art and novels to reflect that, especially as I get older. Ambiguity and colors are everywhere; let it be so in the games we play. The setting that I envision, the cities of Cammaris and the Southlands of Kyskun more generally, will be open, malleable, and loose by design, so that others can enhance it in individual (or rather, group) instances with their own creativity. I am focusing on description and development of fictional cultures, politics, religions, and history. My aim is to make each of these aspects complex. One thing that I am saying is that, in describing these imagined lands, I am not interested so much in oppositions of right and wrong, good and evil, white and black, purity and dirt, civilization and primitiveness; I am saying these constructions are false, our world is more complex than these dichotomies, which do not hold the richness of experience but rather the poverty of abstraction. I’m interested in imagining lands where heroes and villains are impossible, lands that are populated instead by people who strive and grow; explore and experience; fulfill their potentials while walking, supporting, or wrecking a balance between social order and individual rights–or by doing all three at various points or turns. This is a vision, not a manifesto. It’s what I see right now as I dig into this project. If or when it changes, I’ll update. The Princes of Hellsport have given the citizens certain licentious freedoms that were constrained under Paltinian theocracy. Largely these are freedoms of the body: freedom of movement after dark; freedom to consume all types of meat, alcohol, and drugs; freedom to choose marriage or not, regardless of gender, and the provision of polygamy licenses. Freedoms of the mind have also been granted: the right to literacy and debate; freedom to consume mind-altering or -enhancing drugs; freedom to freely research and practice conjuration, abjuration, and augmentation; and the establishment of Shadow and Lantern Academy of Summoning. In a word, no. I don’t believe you ever laid eyes on the Princes during your time in Hellsport. From what I understand, most of your hours were spent in gibbering revelry as you staggered between poniam dens and liquor pits in High Ock. Besides, your sister has already completed several sections of the Hellsport edition; she has told me that you and she planned to collaborate, but after your draft, which is at least erroneous and probably offensive to the majority of Hellsportans, I have decided to depend solely on Bannia’s material. I trust that this will not cause family problems. If it does, Bannia has my support at this juncture. Do not forget that no small measure of your fame comes from more sober, considered material you’ve written for Bousprint. Please be aware that I still hold your critical analyses of Raspician martial arts in high esteem; perhaps after you’ve recovered from your latest excesses, you could return to such material. Please find attached a first draft of the introduction to Traveler’s Handbook: Hellsport. I anticipate your comments and criticism, but bear in mind that I mean no insult–I believe that I qualify my criticisms of the consistent obesity of the rulers. They are leeches, one way or another. Perhaps I should work that image into the rewrite. Reasonable travelers do not come to Hellsport. Respectable citizens of the Southlands have no reason to visit Hellsport. Hellsport: the name is enough to ward away the sane. This is by design, and the design is formed by the action of history. This salted city on the westernmost finger of Cammaris wasn’t always exactly this way: corrupt, eaten, pillaged by a cabal of fat wizards. But one does not speak this way of the rulers of Hellsport–no, they are the Princes of Hellsport, formerly the Princes of Wedgewood, formerly students of Wedgewood Academy, when such a place existed except in name. I’ve been to Hellsport. Before it was Hellsport, when it was Jannyn, a city consecrated to Paltin and governed by the Paltinian Virtuous Codes. And it was stuffy, and the bells rang at every hour, then fell silent at dusk, and the Dark Patrollers came on duty and curfew was imposed at the rising of the Six Sisters every night except for the sixes. Jannyn then, Hellsport now, is a city of superstitions. I’ve been to Hellsport since the Princes have instated themselves. I’ve witnessed the reversals: from discipline to debauchery, from sanctimoniousness to sacrilege. But the superstitions stay: the power of numbers, the selling of charms in the streets, the prayer beads and fasting and blood sacrifice and cannibalism–it’s all of a piece, you see. Superstition, stupidity, and nowhere is the light of reason. No science as you see in the colleges of Nocren, Badtisof, and the southeast Cammarisian cities now that the Iba Divide has been bridged. No technology. An abundance of superstition. But I am being unkind, for superstition is fertile ground for breeding power. And Hellsport, formerly Jannyn, craves power. The city itself does: the citizens, bent with holy books or salacious with vampiric dreams, decline themselves to empower their rulers. And notice how the rulers have always been fat–not in a healthy way, not in a way that suits the powerful or beautiful, but in a corrupt, uncontrolled way. The Priests of Paltin and their figureheads were never robust. The so-called Princes of Hellsport hide their bulk in shadows and indigo robes. This is pompous bulk, excess in excess of excess. And one wonders; for all their proclamations, mere blood and bone and essence of shadestuff could not stuff them so. I think they are eating their citizens. I’ve been to Hellsport. I’ve survived, but I’m famous and benefit from a level of social immunity. I’ve seen the princes and, as a child, saw the priests. They do not interest me, so let me set them to the side. Let us visit Hellsport and mingle with the unfortunate citizenry, the poor souls and fools. But not all are poor; perhaps most are not fools after all. People live in Hellsport; they struggle and laugh and work, play, love, and rest, despite the dour political climate and the tyranny of gluttons. How much superstition holds them? And how long can superstition hold? Let us consider. Let’s see what happens with this. I have a terrible history of starting projects I don’t finish. I mean, look at the last time I posted anything here. Well. As happens when I drive long distances like I did today, my mind travels and dreams expansively. So now I’ve got this idea for Traveler’s Handbooks: travel guidebooks for imagined lands. If they happen, if I follow through–and that is an if, because I have other writing projects prioritized–they should be ideal fuel for role playing games. A handbook may provide geography and locales, cultural information and flavor, and history for a specific city and its surrounding area. These cities are in a country–the term is used loosely, meaning a geographic region, not a united political state–called Cammaris. Enough speculation. Let’s see what happens here. 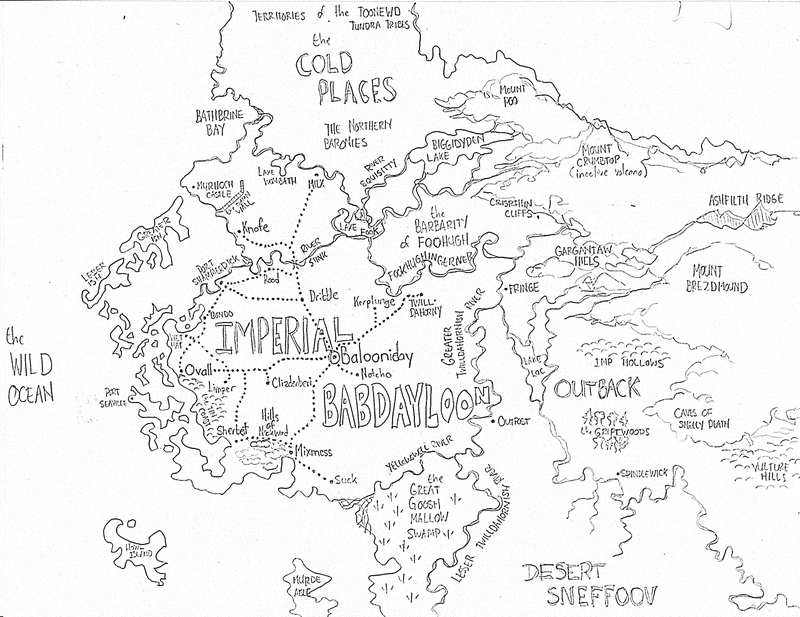 Here’s a map of a silly fantasy world, “Imperial Babdayloon”. I think it originated from a spoof I was writing about Christopher Columbus; this would have been the “Europe” that the Columbus character originated from. Mostly this map was just an exercise in fun. I thought I would post it here in case anyone can find a use for it as a good lighthearted or satirical setting. If you find a use for it, please post in the comments.